Autumn. Sunday morning Bangladeshi breakfast ; Red-checked tablecloth late Saturday lunch ; Card night enchiladas ; Rosh Hashanah dinner ; No stress Thanksgiving -- Winter. Brunch for a crowd ; Chili + cornbread lunch ; Steak house dinner for vegetarians ; Feast of the almost seven fishes ; A not-kosher Jewish Christmas -- Spring. Easy all-green lunch ; Grace's birthday late lunch ; Passover seder ; Tortilla soup for a chilly spring evening ; Just my type of dinner -- Summer. Grilled vegetable breakfast ; Simple backpack picnic lunch ; Afternoon tacos ; Fourth of July ; Middle Eastern dinner outside -- Seven lists -- Recipes by type -- Even more menu suggestions -- A few notes on tools + ingredients -- Give back + do good. Now & Again includes 20 menus and more than 150 recipes for crave-worthy dishes such as meatloaf, enchiladas, roast chicken with sweet potatoes, vanilla semifreddo with honeyed strawberries, and double-baked potatoes with horseradish and cheddar. 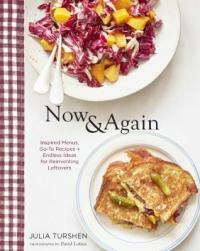 Throughout the book, the author's 'It's Me Again' mini-recipes transform leftovers into new, delicious recipes. -- Adapted from book cover.